About Pixelhobby UK - Share your crafty passion with younger ones as you make these vibrant characters with Pixelhobby UK. Though the designs seem elaborate, it couldn’t be easier to get started with their XL kits. No tools are required as the XL pixelsquare is four times bigger than the standard size, meaning absolutely everyone can have a go. Pick your project, line up the coloured squares atop a plastic base plate and in a matter of minutes, you’ll start to see patterns emerging. Let's Get Started - 1 Choose your design and the corresponding pattern sheet. Use the guide on the pattern sheet to colour match your pixel squares. Each tile has a domed upper face and a small hole in the bottom. 2 Take a plastic base plate with the pins facing up, then lay over the pattern sheet so the colours are visible. Choose a suitable point along one edge to start adding pixels and press out a handful of the XL tiles in the correct colour. 3 Take the tile and place it over a pin on the base board so it slips into the small hole. Press down lightly, adjusting the angle so it is parallel to the edges of the base plate. 4 Add more tiles in the same way and check the positioning is correct before pushing them all down completely. If you are tiling one long side of the base plate, it’s worth pressing the edge against a flat surface to straighten them all before flattening the tiles completely. The popularity of these magical creatures shows no signs of waning any time soon. Get in on the trend with the XL 1 Baseplate Unicorn Kit which comes complete with a matching frame for a perfectly pink finish. You'll find plenty more designs on pixelhobby.org.uk too! Pixelhobby UK's magnet kits are a great starting point as not only are they quicker to complete, each one comes with three free patterns! Head online to find a list of Pixelhobby UK's stockists who can supply you with the individual baseplates and colours you'll need to make your free patterns as well as using up any spare pixelsquares from your kits. EXCLUSIVE OFFER! 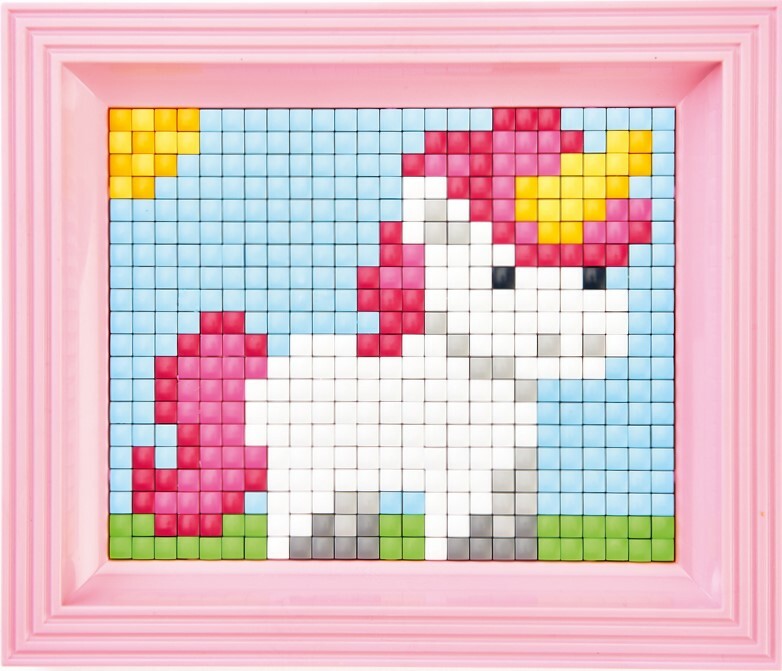 - The Crafter’s Cavern who stock Pixelhobby UK products are offering 15% off orders over £30 and 25% off orders over £75 using the code SAVE25. Head to crafterscavern.com to save today!